On Oct. 26, the Jewish Community Relations Council (JCRC) of the Jewish Federation of Greater Dallas hosted one of Israel’s leading Arab citizen change-makers to meet with JCRC and Federation leadership, community members and students. This was a rare opportunity to hear about realities, complexities, challenges and developments in Jewish-Arab relations within Israel from an insider’s perspective. 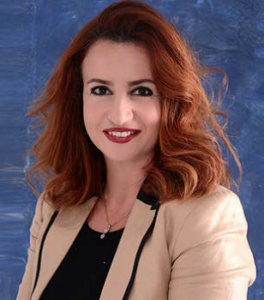 Ms. Ghaida Rinawie Zoabi, founder of INJAZ Center for Professionalization of Arab Local Governance, has become a key figure in the efforts to build stronger and more productive cooperation between Israel’s Arab towns and cities and the central government. In 2011, she was named one of Israel’s 100 most influential people by The Marker magazine and in 2015, became the first Arab woman to be awarded Israel’s Good Governance Prize. Ms. Zoabi comes from a rich background of work in education, organizational development and community activism, with special attention to women’s rights. Ms. Zoabi is also one of the first Arab fellows — and the first Arab woman fellow — at the Shalom Hartman institute in Jerusalem. Zoabi was accompanied by Ms. Liron Shoham, associate director of the Inter-Agency Task Force on Israeli Arab Issues. The Inter-Agency Task Force is a coalition of mainstream North American Jewish organizations committed to learning and raising awareness about Israel’s Arab citizens. Shoham provided background and a short overview about Arab citizens and Jewish-Arab relations within Israel to set the stage for Ms. Zoabi’s talk, noting that Israeli-Arabs make up over 20 percent of Israel’s population, and government efforts to close the large economic gaps between Arabs and Jews for the purpose of stronger economic growth overall, also create opportunities to change Jewish-Arab relations for the better. Zoabi, who comes from Nazareth, shared a bit about her own personal history as an Arab citizen of Israel, and what made her dedicate her career to developing accountable municipal leadership in the Arab community as the key to improving the status of Arab citizens of Israel. Working with 66 out of 80 Arab mayors in Israel, INJAZ guides Arab municipal leadership towards greater accountability, transparency and effectiveness at implementing development plans and cooperating with the central government. Now the second largest Israeli-Arab nonprofit organization in Israel, INJAZ also works to prepare and train rising young leaders, especially women, aspiring to elected office and municipal positions in Arab towns and villages. “This was an excellent opportunity to hear from one of Israel’s leaders in the Israeli-Arab community,” said Cindy Moskowitz, former JCRC Executive Committee member and Jewish Federation board chair. “I’m so glad I was able to attend,” she added. The Dallas Jewish Historical Society (DJHS) will host Rabbi Ken Roseman on Wednesday, Nov. 15, at the Aaron Family Jewish Community Center, 7900 Northaven Road in Dallas, at the kickoff event of the DJHS Annual Lecture Series. The event is free to members of DJHS, $10 for non-members. Reservations are requested at 214-239-7120 or at the DJHS website: bit.ly/MakingHistoricalChoices. Roseman is a graduate of Oberlin College and was ordained as a rabbi in 1966 at the Hebrew Union College–Jewish Institute of Religion in Cincinnati, Ohio. He holds a Ph.D. in American-Jewish history and has taught at HUC, SMU and Texas A & M University–Corpus Christi. Roseman served as a congregational rabbi in Madison, Wisconsin, at Temple Shalom in Dallas and led Congregation Beth Israel in Corpus Christi until 2014. In Corpus, he also serves as a major community leader, is sought after as a public speaker and continues to teach history. The DJCF recently announced that a $5,000 scholarship award is now available for one Jewish Dallas-area high school junior or senior to participate in a one-in-a-lifetime European-Israel educational experience (i.e. March of the Living, Heritage Quest, or other approved programs). The Daniels Family Israel Education Endowment Fund of the Dallas Jewish Community Foundation was created by Edwin R. Daniels, z”l, with the hope of engaging “under-affiliated” Jewish teens. Now in its third award cycle, the DJCF is specifically seeking a student with strong leadership skills and diversified extracurricular activities. Some involvement in Jewish activities will not disqualify any applicant; however, applicants may not be current or past Jewish day school students or have attended any Jewish overnight camps. To be considered for this scholarship, applicants will submit a completed application, parent/guardian essay, and a letter of recommendation from a teacher, counselor, or coach. To learn more about this opportunity, visit www.djcf.org. Jewish Family Service announced this week that Dr. Jill Biden will be the featured speaker at the 2018 Woman to Woman event Wednesday, April 25. The luncheon will be held at the Hyatt Regency Dallas. Honorary chairs are Paddy Epstein, Ann Kahn, Lisa Kleinman, Ann Rosenberg and JFS staff. Co-chairs are Susan Frapart, Linda Garner, Sherry Goldberg, Julie Liberman, Beverly Rossel, Monica Susman, Laura Weinstein and Ethel Zale.